Distribution and status of clouded leopards in Sabah, Malaysia, and genetic ancestry of clouded leopards on Borneo and Sumatra. I conducted field work in Tabin Wildlife Reserve, Sabah and I'm doing genetic analysis at the University of Würzburg, Germany. In comparison to other larger cats almost nothing is known about the secretive behavior of beautiful clouded leopards. If we don't take action now, we might lose a flagship species without learning anything about it in the wild. 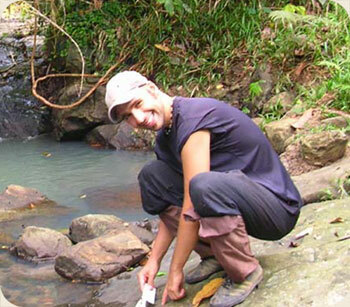 I gained experience in wildlife research during internships in Nepal, South Africa and Borneo. These practical experiences helped me in planning my own field study. I love to be a part of the tropical rainforest. Being out in the field is very relaxing after your work at home in the laboratory and in front of the computer. This variety makes my job so diversified and fascinating. I can only motivate you to make your own experience, but you need a lot of patience and the ambition to work hard. Try to get your own ideas realized and start to write a detailed proposal for your plans. Don't be afraid to contact scientists who might be able to help you. The experiences of other researchers are very important for the design of your own work, because usually all failed trials won't be published scientifically. I'm very sure clouded leopards can survive in the wild, but we need to study and conserve them in other places in addition to the few protected areas. Most of these reserves will be too small to harbor stable clouded leopard population over the long term. Conservation must also take into account the interests of commercial land owners to evaluate ways for a sustainable management of their vast areas. The opportunities for low impact logging need to be made more attractive to land owners, in comparison to the possibility of habitat conversion to agricultural land. You can become a supportive member of the Clouded Leopard Project and you can raise the awareness of your friends and colleagues for this species. However a major threat for clouded leopards is the logging of the remaining forests in Southeast Asia. In these times of different crises in the world, the media is not giving a lot attention to these vast logging activities. But you can help to put attention on these problems.